An international team of researchers, including David S. Aguado, Jonay González and Carlos Allende Prieto of the Instituto de Astrofísica de Canarias (IAC), has found a star with extremely low metallicyt, one of the oldest in the Milky Way, and for that reason an excellent messenger from the early universe. The star Pristine 221.8781+9.7844 is one of the oldest stars in the Milky Way. We know this because of its atmosphere. Just after the Big Bang the universe was full of hydrogen and helium with very little lithium there were no heavier elements because these are synthesized in the interiors of stars. David Aguado´s view is that "As the atmosphere of the star we have analyzed is very poor in metals, we can say with confidence that this is one of the oldest objects in the Milky Way, and of course it is much older than the Sun" and he adds that "This star will help us to better understand certain features of the origin of the Milky Way and how the first stars formed"
To reach this conclusion detailed studies have been performed with the ISIS spectrograph on the William Herschel Telescope and with the IDS spectrograph on the Isaac Newton Telescope, both belonging to the Isaac Newton Group of Telescopes (ING) at the Roque de los Muchachos Observatory (Garafía, La Palma). "The spectroscopic data with intermediate resolution obtain on the INT and the WHT, telescopes on La Palma have allowed us to show the low content of carbon, which is usually very abundant in this type of stars" explains Carlos Allende, a Professor at the IAC and one of the researchers in this project. The study of these very old stars, which have been catalogued and analysed in the Pristine survey, led from the Leibniz Institute of Astrophysics (Potsdam, Germany) and from the University of Strasbourg (France), help us to learn more about the state of the universe in its early days, just after the Big Bang. 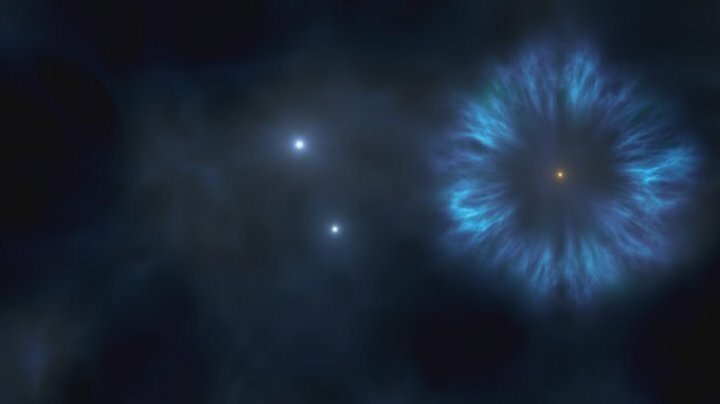 To make the first detections of these stars, which are survivors from the first stages of the universe, and have pristine atmospheres, the team used a special colour filter on the Canada-France-Hawaii Telescope (CFHT) on the top of Mauna Kea (Hawaii). In this study has been used high-resolution spectroscopy obtained with the UVES spectrograph in the VLT telescope (Paranal, ESO). "The high resolution spectroscopic data from UVES and the VLT have allowed us to measure the abundance of lithium in the atmosphere of this star, which gives us additional information about the origin of the universe" says Jonay González, a Ramon and Cajal researcher of the IAC and a collaborator in the Pristine project.